Rice is one food item that can be cooked in a variety of ways. This is an easy recipe to create a yummy version of freshly cooked or leftover rice. Put in some interesting ingredients and sprinkle a dash of lemon to make yourself a bowlful of tangy tasteful lemon rice any time of the day. It’s a welcome change to be served at family get togethers too! Put a wok on medium heat and put oil in it; once the oil heats up throw in the mustard seeds. As soon as they crackle add the curry leaves. Throw in the onion and sauté until translucent. Now add the spices, boiled veggies and roasted peanuts, mix and toss to coat nicely. Add the boiled rice and toss gently so as not to break the rice too much. 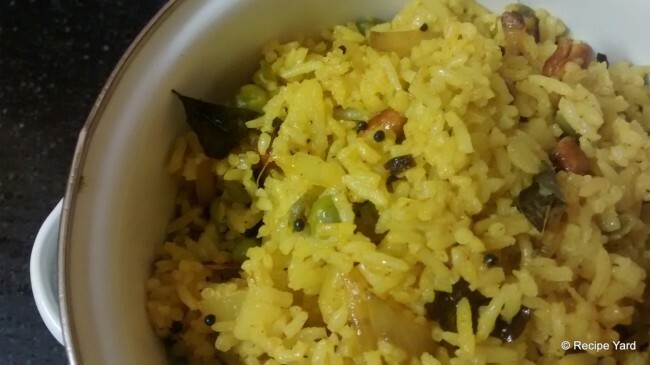 Turn off the heat and drizzle the lemon juice over the rice. Give a final toss and transfer to a serving bowl. Serve hot!